Deric's MindBlog: Features of Einstein's brain. 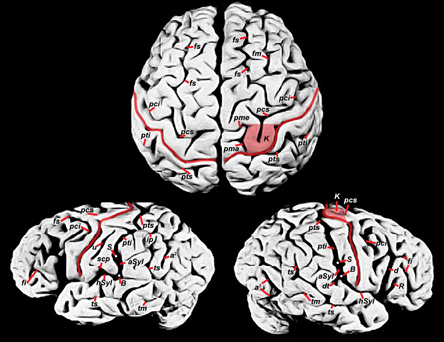 Like Witelson's team, Falk found that Einstein's parietal lobes were larger; comparing the photographs of Einstein's brain with a second previously published set of 58 control brains, Falk also identified a very rare pattern of grooves and ridges in the parietal regions of both sides of the brain that she speculates might somehow be related to Einstein's superior ability to conceptualize physics problems. Indeed, during his lifetime, Einstein often claimed that he thought in images and sensations rather than in words. Falk speculates that Einstein's talent as "a synthetic thinker" may have arisen from the unusual anatomy of his parietal cortex. The emerging bottom-up world order? Can evolution explain how minds work? A bird that follows human eye movements. Neural mechanism of first impressions. MindBlog is on the road again. The surprising power of neighborly advice. The decline of science journalism. An online 'science of happiness' course.